Our multiple safety signs are the perfect solution for your safety signage or bilingual signage needs. 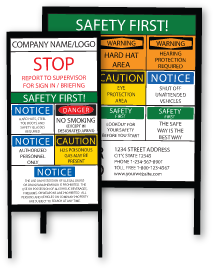 We combine all of the safety signs you need for your particular location into one easy to read, convenient sign. We can customize your multiple safety sign to display your company name, job site info, and any other wording you may need. Frames are available for all of our multiple safety signs. Custom Multi Safety Signs Our multi safety signs are built for durability and longevity in harsh outdoor conditions. 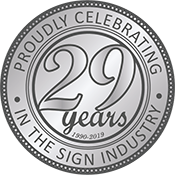 Signs are available with mounting grommets, for mounting on fences, or custom heavy duty angle iron frames.